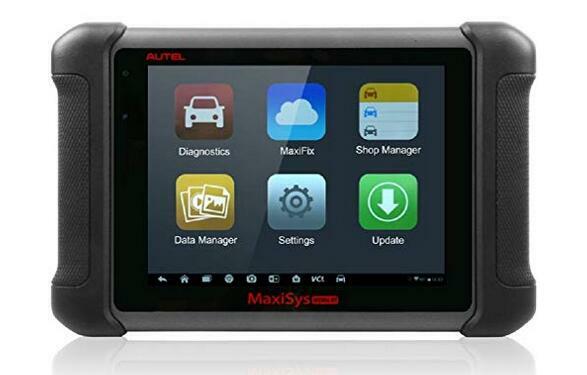 AUTEL MaxiSYS MS906BT is one of the best Profesional Automotive Diagnostic Tools in the market for technicians and professional mechanics. In this review, I will provide you with the most details about this Autel Scanner. 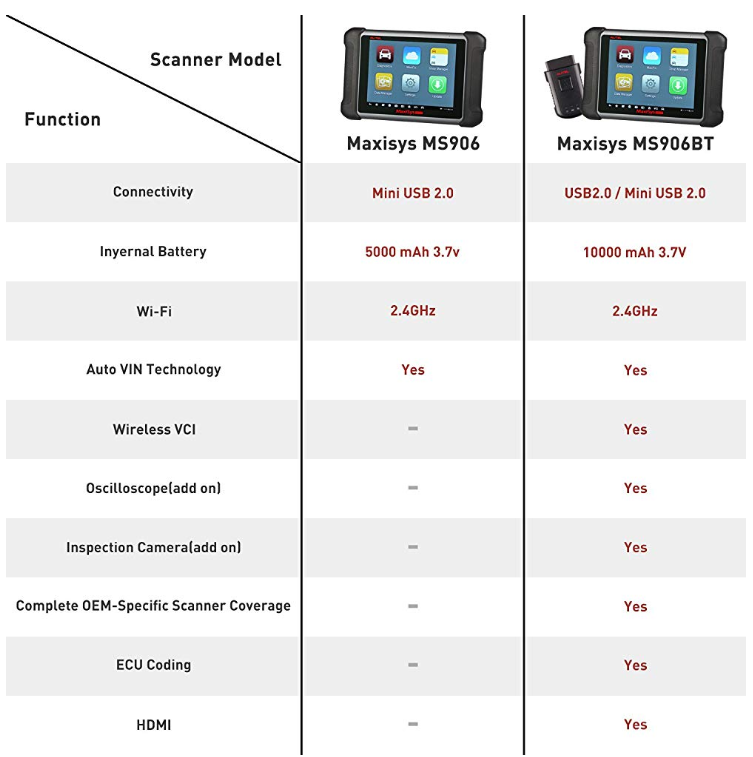 The Autel Maxisys MS906BT and MaxiSYS MS906 have the same OBD scanning and testing capabilities. They both support reading/clearing codes, live data, actuation tests, ECU coding, and adaptations. Plus they look a whole lot similar in physical appearance. However, the latter just gets the edge over its predecessor in terms of overall functionality. For instance, it can connect to a car’s OBD system using VCI. That is a wireless connection which basically allows you higher mobility. There’s the option of adding an inspection camera to the scanner. The camera doesn’t come with the default package though, it is sold separately. Here are more unique features that you will get from the Maxisys MS906BT. The scanner runs on an open-source Android operating system (OS). It also features a powerful Exynos 6-core processor with amazing multitasking abilities. That is why it is very fast to boot up and run scans/tests. 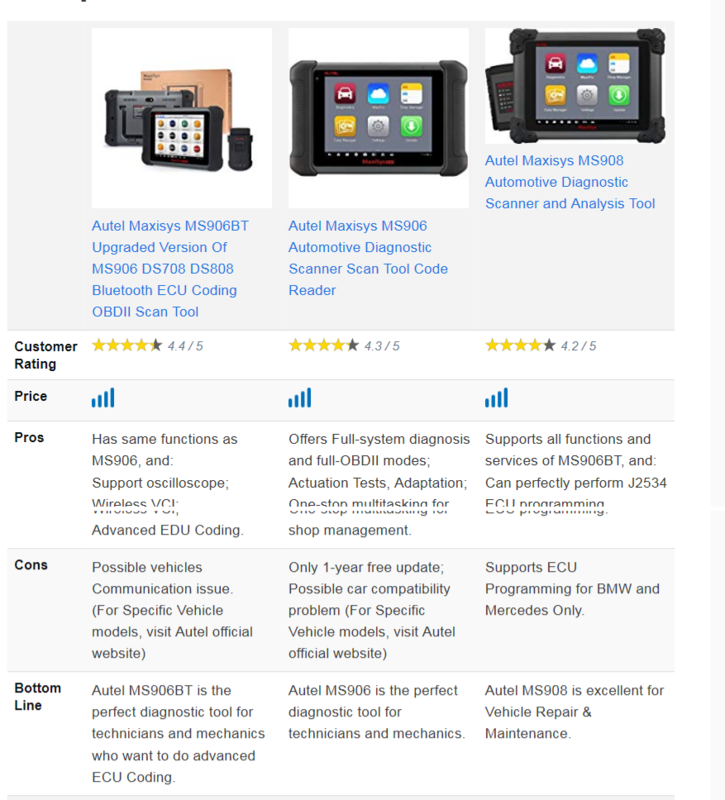 You can use this scan tool for all OE-level OBD2 diagnostic tasks. That includes reading/erasing codes, live data, freeze frame data, active tests, ECU information, matching, adaptation, data logging, ABS Bleeding, Oil Reset, TPMS Programming, and so much more. The Smart AutoVIN technology makes it so easy to identify a car. As one of the leading professional automotive diagnostic scanners, the MS906BT is compatible with so many car makes and models. You can use it on over 80 brands of US, EU and Asian-made car models with OBD2 systems. 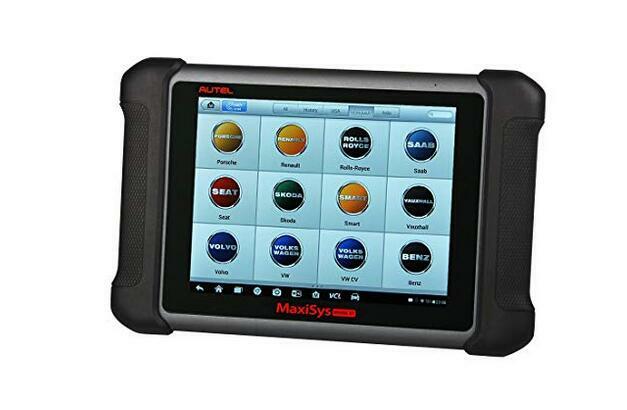 The comprehensive help and support you get when using the Maxisys MS906BT is yet another reason why it qualifies as one of the best professional automotive diagnostic scanners. Fitted with a Wi-Fi module, you can go online to browse for verified diagnostic and repair tips for any vehicle. Even better, the MaxiFix community (used by Autel customers) is a great platform for getting proven fixes and recommended parts. In case you need further assistance you can reach the manufacturer directly using interactive data logging. They will give you troubleshooting, diagnostic and repair guidance to help you get any job done. First things first, the MS906BT is well-sized for portability. It measures 25.6 x 16.7 x 7.4 inches and weighs 19.25 pounds. Not so different from a tablet. As a matter of fact, the 7-inch LED touchscreen will leave you feeling like you are using an ordinary tablet. The 1024 x 768 resolution displays images with unmatched clarity. Besides that, the built-in lithium-polymer battery allows you up to 14 hours of continuous use without charging. That is a lot more time than you will get in other professional automotive diagnostic scanners. Finally, the scanner supports USB connection and also features audio and auxiliary connectivity ports. A brief look at the Maxisys MS906BT’s features will automatically tell you it fits among professional automotive diagnostic scanners. The fast speed, multitasking capabilities, database for organizing customer/vehicle data and advanced functionality make this scan tool ideal for professionals who offer auto services.